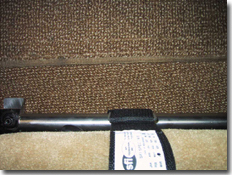 This bar is designed to mount the 5th and 6th point in a seat belt harness system. A hoop keeps the belt(s) from sliding. This bar mounts under the seat rails and allows the seat to have full travel. It can also be used under either seat. No modification to the car is required. Constructed with high quality stainless steel and is tig welded.